Removing unwanted hairs from the body is essential for sophisticated men. For that, a body grooming kit is crucial. Philips is an old and popular name for men’s grooming products. They have some special body grooming machines on the market and these are dominating the body grooming market currently. The Philips Norelco Bodygroom 3500 is their 2nd generation body grooming kit while the 3rd one is Philips Norelco Bodygroom 7100. The Phillips Norelco Bodygroom 3500 promises to provide you a safe, gentle and a fast trim and shave every part of your body from below the neckline. Here I’m going to share all my experiment and experience on this device and it might help you to decide if it is competent for you. You can shave or trim any area of your body through this Phillips Bodygroom 3500. You will be able to trim/shave any hard to reach areas like your back side of the body, shoulders through the extra-long back attachment. The blades are designed very comfortably and efficiently which will contact with your skin very smoothly. It comes with hypoallergenic foil system for maximum skin comfort. This Phillips body grooming machine is powered by rechargeable lithium-ion battery which will provide 1 hour of running time per 1 hour of charge. The body groom is engineered with a showerproof design. The handle is made with rubber grip. Cleaning and maintaining is pretty easy. You know, shaving or trimming the hairs from our back side is pretty hard. As we can not touch the back part of your body with hand, we rarely can remove hairs from that area. But an extra-long back attachment comes with the Philips bodygroom 3500 package which will allow you to shave your back without any issue. It can reach any area of men’s back side and catch all hairs easily. The blades are engineered with rounded tips for smooth skin contact. The blades are skin friendly and they will prevent your skin from nick and cuts. 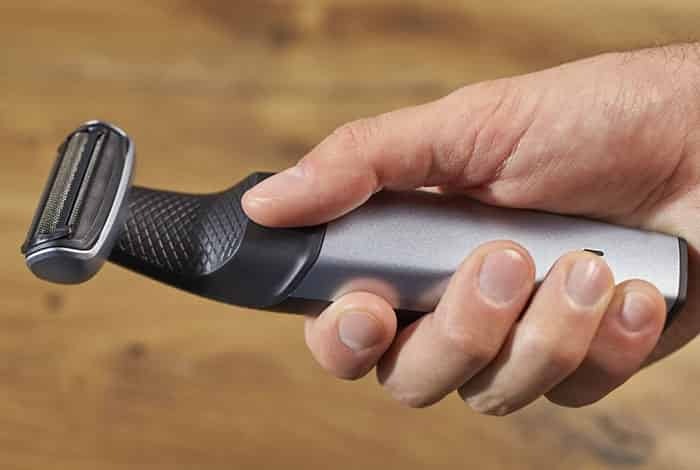 The Phillips Norelco claims that the innovative shaver head can capture any type of hairs like – short hair, long hair, and thickest hairs in a single stroke without any issue. Besides shaving, you can trim the hairs with the grooming kit. There are 3 adjustable trimming combs with this package: 1/8’’ (3mm), 3/16(5mm) and 9/32’’ (7mm) to trim the hairs. This trimmer can handle any type of hair. Phillips Norelco recommended the user to trim the hairs first and then shave to get an optimal shaving performance. The Phillips bodygroom 3500 is made for full body grooming. 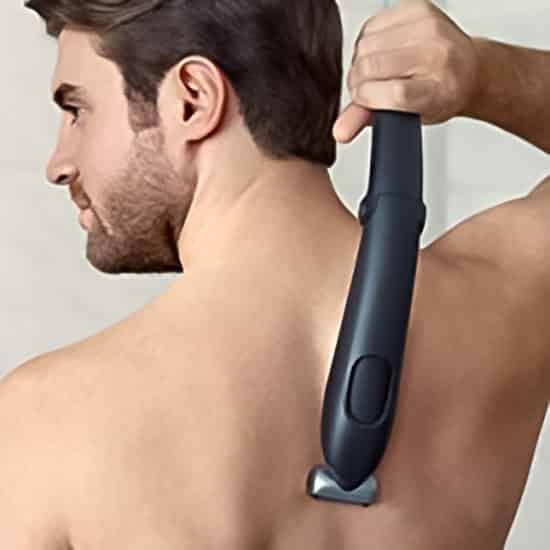 It will provide you a comfortable grooming solution in which area you need to groom – for your back, chest, abs, underarms, groin area and legs. The bi-directional trim guards of this package have 3 length settings and they can cut longer hairs easily. This body grooming machine comes with a waterproof design. The handle is fully water resistant. For that, you can use it under the shower without any tension. You can use this machine wet or dry. But you will get better performance if you will use it dry. Since this Body groom is fully water resistance, cleaning is very easy. This Phillips Body grooming machine is powered by rechargeable lithium-ion battery. This battery will deliver 60 minutes of running time per 1 hour of charge. This advanced lithium-ion battery will provide maximum powerful cutting performance. The LED display will provide battery notification when the battery is low and when it is full. Phillips North America Corporation warrants full 2 years for their every shaving and grooming products from the purchase date. Within 2 years, if your product damages against materials defect or workmanship, Phillips Norelco will repair or replace your product (except cutters and blades) without any charge. This warranty does not cover if your product damage for any accident, misuse/abuse, and lack of reasonable care. So always handle your product very carefully. To get all the services, keep all the included papers carefully. After buying this product, if you do not feel fully satisfied with the shaving/trimming performance, you can return this product to the producer. If you return this product within 45 days, Phillips Norelco will provide your full money back. NOTE: This service does not cover over damage product (handle). This Phillips Norelco BG3500 is powered by rechargeable lithium-ion battery and this battery will deliver 60 minutes of running time with per hour of full charge. After fully charged, the LED indicator will flash continuously that’s mean the battery is full of charge. Before using this Bodygroomer 1st time, charge it completely. Otherwise, the battery may damage. Only use the included power cord. When you charge this machine, be sure it is switched off. It is not recommended to recharge the groomer until the battery is fully empty. This body groomer is only for the body. Don’t use it for your facial hair. In which areas you can use this grooming kit? – Back and shoulders, chest and abs, legs, underarms and on your groin area. Use the trimming guards on your sensitive areas. Move the groomer gently and smoothly. For optimal performance, move it against your hair growth. Before use, make sure the battery is fully charged. Always follow the instructions of the user manual. There are 3 adjustable trimming combs for 3 different lengths. Don’t move the trimmer quickly, move it gently over the skin and if you are trimming for the 1st time you should be more careful. NOTE: trimming will be easier when your hair is dry. Since there are 3 trimming combs (3mm, 5mm and 7mm), select and snap the desired trimming comb attachment onto the groomer- the teeth of the comb should points towards you. Now press the ON/OFF button for turning power ON. To get an optimal trim, move the groomer against the hair growth. Try to move it gently don’t press it too hard. Always be sure, the comb is fully connected with your skin. Remember, this Phillips Norelco bodygroom BG3500 is a body groomer only. So, don’t use it to shave or trim your facial hair. You can use it on all over the body. When you will shave your sensitive areas for the first time, you may have to feel some irritations and discomfort. It is normal; it will take some time to adjust with your skin. Dry use is much better and faster than the wet use. Because before a wet use, you have to prepare your skin with shaving gel or foam. Before shaving, make sure the foil is in complete contact with your skin. 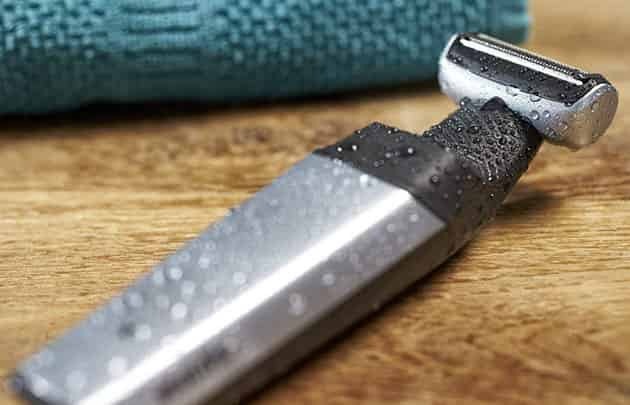 Move the shaver gently over the skin; don’t press it hard otherwise it can be the cause of skin irritations. 1st of all, you have to press the release button to open the back shaving attachment. Then place the grooming machine in the lower part of the ‘’back attachment’’. You have to press the on top of the ‘’extra long back attachment’’ holder until it locks. Now, switch ON the groomer and shave your back by moving the handle up and down. This handle can be folded to different angles. To remove the groomer from the extra long back attachment, pull the groomer towards you until it releases from the holder. To close the back shaving attachment, you have to press the release button again and then push the handle against the holder. Since this Phillips Norelco bodygroomer is water resistant, cleaning this device is so easy. And there is no risk of water causing problems. The manufacturer recommended to clean the groomer after every use. Proper cleaning and maintenance will give you a long lasting optimal shaving/trimming performance. Before cleaning, be sure the groomer is switched off. Remove the trimming comb from the groomer. Now you need to remove the shaving head by pulling it off from the groomer handle. Hold the shaving head under running water for removing the loose hair and debris. Now clean the hair chamber with a cleaning brush even you can rinse the hair chamber. For hygienic cleaning, you can use a bit of liquid soap. Don’t use cloth or tissue to dry the cutters and foil, it may break. Close supervision is essential when you will apply it on near children or invalids. Never charge the groomer beside the skin or bath tab where it can fall into water. Only use the included AC adapter. After a full charge, unplug the groomer immediately from the electrical outlet. Try to follow all the instructions of the user manual. It is a body grooming kit, so don’t use it for your facial hairs or your head hairs. Before connecting the adapter with the electrical outlet, check it. Never connect a damaged cord with the electrical outlet. Keep the groomer and its charger away from the heated surface. Before use, always check the trimmer, foil, cutter, and blades. If they are damaged, don’t use it without replacement. The hypoallergenic foil is very good for skin even in sensitive skin. Multiple trimming heads for different hair lengths. The extra long back attachment handle helps me to reach any areas of the body. Not for facial hairs. Need to buy a facial shaver separately. It is a popular bodygroomer on the market and most of the customers provided positive reviews. Where some users have negative reviews too. My personal rating of this shaver is 4 out of 5 and if you are really looking for a bodygroomer, you can make a try on this groomer. It’s risk free as you can return it to the dealer in case of dissatisfaction within 45 days. 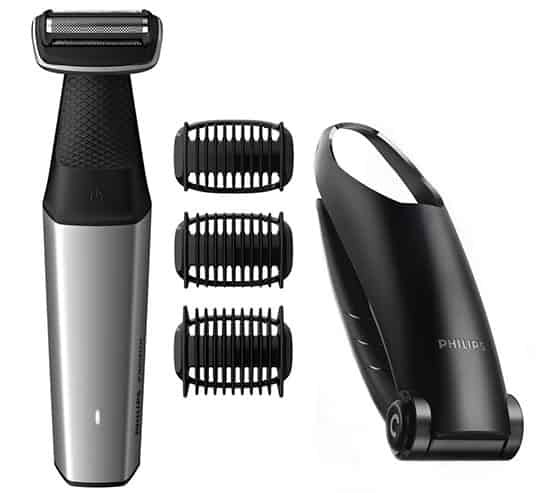 If you are looking for a groomer with a facial hair shaving and trimming capability, you can rather select the Philips Norelco Bodygroom 7100 instead. But there is not back grooming attachment in with the Philips Norelco bodygroom 7100 where you are getting the long back shaving attachment with the Philips 3500. The Philips Norelco Multigroom 7000 will also be great for whole body grooming including face and head.